This was originally submitted to Amazon as a review, which was rejected. Hence I will review it here. I do not get any monies from reviews; but felt that the reviews for the dock on amazon were all negatives and one should review it with the proper way to update the dock. For HP ZBook 150W Thunderbolt 3 Docking Station 5 Stars. I receive, from my work, this dock with an HP ZBook 15 G3. Out of the box I did not notice any issues and everything seemed to work fine (with no updates having received this on 9/2018). But since I was using the laptop/dock with a 34 inch monitor I wanted to make sure the video drivers were up to date. So to update the individual components on the dock, I went to HP’s site and from the dock’s info page, I downloaded two update packages specific for this dock. (See picture of the finalization of the update where it checks individual components to verify if they need updates). Once I did that update the Ethernet port failed on the dock but worked on the machine. Reason being is that the Ethernet driver is held on the PC and not the dock. So the PC was not playing well with the dock; people have assumed its the other way around and given bad reviews. What I discovered, in researching and reading from others who had the issue as reported on the HP forums was that the Ethernet port on the dock is different from the one on the laptop and needs a specific driver. 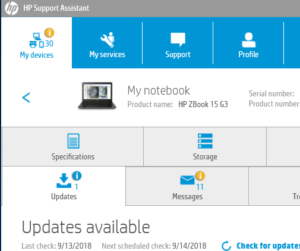 While doing research to find the exact driver, I discovered that HP, like Dell, has an updater program called `HP Support Assistant. (Makes life soooo much easier to update machines these days with these programs). I had the site load software which recognized my pc and downloaded the HP Support Assistant. Once installed it correctly determined the make/model and warranty status of the machine. (See pic 2). Most importantly when one allows it to scan the PC it finds all the drivers which need updating, and updates them with minimal help from the end user. Since it was a new laptop it had 16 items, the Ethernet port as one of them, which needed to be updated. After all those updates, all worked with the machine and the dock; and its Ethernet port. Long story short is that other people had real problems, but were unable to update the device & PC so it can work properly. If you use the HP Support Assistant and keep fresh with the updates, at least as of this writing, all is great with this dock. The only con I notice is that when switching virtual windows on my 34 inch monitor, it is not as fast as when I switch using a different computer with a dedicated graphics card. I do not work for HP/Amazon or any company entity associated with the dock or PC.